Starting point guard D’Angelo Russell sat out the game due to knee soreness. Tyler Ennis played 39 minutes at the point instead. Brandon Ingram started out a little too hot—putting up 8 points, 3 assists, and 2 rebounds in nine minutes of first-quarter play—so Luke Walton benched him for the rest of the game, with right patellar tendinitis offering plausible deniability. 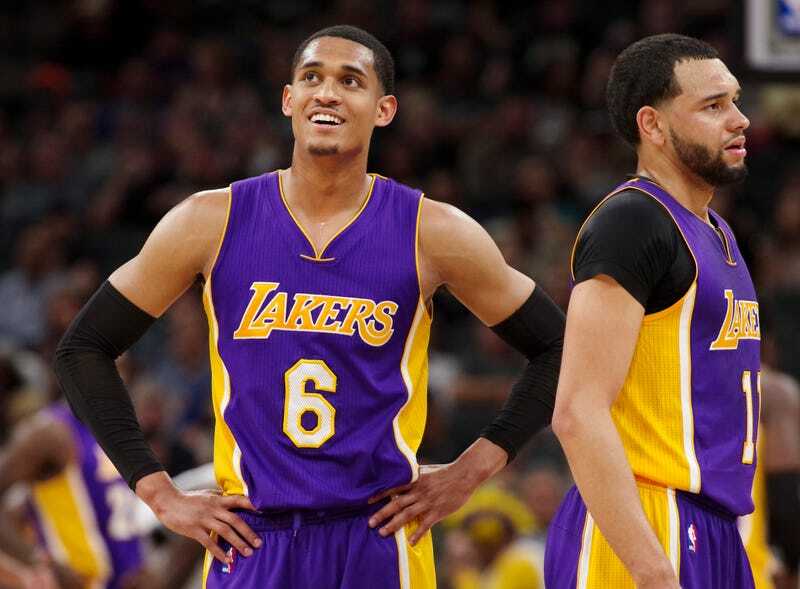 Jordan Clarkson, Julius Randle, and Larry Nance, Jr., a trio that accounted for 43 of the Lakers’ 76 points through the first three quarters, sat out the last period. Tyler Ennis, David Nwaba, Thomas Robinson, and Tarik Black played that entire quarter in their stead. Metta World Peace, age 37, logged 17 minutes. Something else that doesn’t make much sense in the long run: winning a basketball game while jockeying for lottery position, with protected picks at stake. The Lakers only get to keep their 2017 first-round pick if it falls within the top three; otherwise it goes to the Sixers. If they end the season in sole possession of the third-worst record, they’ll have a 47 percent chance of landing in the top three in the lottery. If they end in sole possession of the second-worst record, they’ll have a 56 percent chance. When the Lakers woke up yesterday morning they were tied with the Suns in the wins column, but they’ve now slipped “ahead” in the standings; looking at last night in isolation, they sapped their odds of holding onto this year’s first-round pick by nine percent. Process Trusters must be salivating. Magic fans too, thanks to a side effect of convoluted pick-swapping. If the Lakers end up shipping their pick to the Sixers this year, they’ll also have to ship their 2019 first-round pick to Orlando. The Lakers have four games left to play, against the Kings, T-Wolves, Pelicans, and Warriors. Don’t be surprised if they start each one with a few ball boys and a sweat mopper in the starting five.